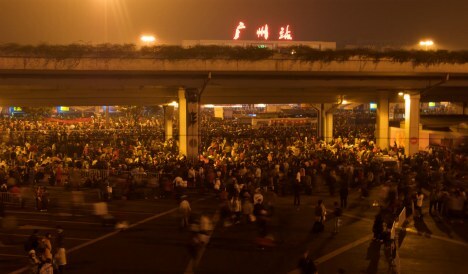 Every year, 130 million people throng China's railway stations, frantically trying to obtain a seat on a train that will take them home for the lunar New Year -- a trip that is for many rural people living and working in the country's industrial cities their only chance to see the families, and even the children, they have left behind. In addition to the human drama, the trek, believed to constitute the largest human migration in the world, taxes the country's transportation systems to the limit. The chaos at the train stations, the stark difference between urban and rural China, and the alienation among families of economic migrants are strikingly portrayed in the new documentary "Last Train Home" by Lixin Fan, who previously worked on the acclaimed film "Up The Yangtze," about the controversial Three Gorges Dam. In his debut feature, which screened at this year's If! Istanbul Independent Film Festival, the director focuses on one couple who have been making the New Year's trip for 16 years, their sole break from a life of difficult factory labor. But, of course, they are not alone. In addition to their millions of counterparts in China, a similar migration occurs each year in Indonesia, where 30 million workers go home for the end of the Muslim month of Ramadan. Such mass migrations "present enormous logistical and safety challenges to local, state, and national governments," Jonna McKone wrote recently for the urban transportation blog The City Fix. "Transport systems are designed ideally to handle maximum capacity, but very few can deal with an additional yearly surge in migrants... [In Indonesia], this important holiday has become a nightmare, as millions of city dwellers attempt to return to their villages but face limited transport options." According to the New York Times, Ramadan travelers in Indonesia "brave enormous jams, exhaustion, and bandits to make it back home," with hundreds dying on the road each year. Though the Indonesian government makes efforts ahead of the holiday to repair roads and carry out other initiatives to ease travel, McKone writes, the problem will remain as long as the world's massive cities continue to expand at the expense of investment in the environment and rural regions. Last Train Home. The movie's website.